Sometimes you can judge a book by its cover. There’s a robot, who I’ll call Auguste, posed on a black box to resemble Auguste Rodin’s famous sculpture “The Thinker.” That black box serves as a metaphor for unanswered questions. 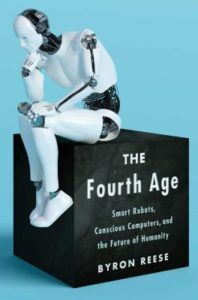 Auguste graces the cover of Byron Reese’s latest book, The Fourth Age: Smart Robots, Conscious Computers, and the Future of Humanity (Atria Books, 2018) in which the reader takes a winding trip through that black box and ends up pondering, as Auguste surely does, what artificial intelligence actually means, what forms it could take, and whether it’s even possible in the first place. What are the four ages? The “ages” implied in the title are the major innovations and resulting evolutionary changes. Reese, a futurist and CEO of technology research company Gigaom, briefly explores each age to lay the groundwork for the rest of his book. Reese tempers his optimism and belief in things technological by considering just about every question faced by AI proponents. He exhaustively explores the labyrinth of opinions, ideas, science, philosophy, and the few breakthroughs people have actually made. He throws A.I.-related concepts at each other to determine which one wins. I can picture Reese as a kid slamming toy cars into each other to simulate a demolition derby. All that exploration and debate makes the black box on the cover of his book far larger than it might appear. When I received my copy of Fourth Age, I cut through the labyrinth and jumped to the question uppermost in my mind. Here’s some background to that question: I’m finally pursuing my ambition to pursue an accelerated B.A. in translation (French-English, Spanish-English, Italian-English). As a result, I’m learning how to use computer-assisted translation (CAT) tools. And I’m learning that translation work is being affected by the “narrow” artificial intelligence applied to the field. My CAT course instructor set me up for certification on a popular CAT system (since completed). Certification involves several courses and exams. One of them centres on post-editing machine translation (PEMT). This is where a computer performs the initial translation and the translator cleans up the machine’s work for human consumption. It helps translators speed up the work they can do, increase throughput, enabling them to charge less for individual jobs and (ideally) get more work so overall income doesn’t fall. Given my ambition, you might guess what I looked for when I first received my copy of Byron Reese’s book on A.I. I flipped to the back of the book, planning to scan the index. Surprise – no index. In a 300-page non-fiction “think piece” this is a glaring omission. According to Reese, I’m in luck. “Jobs That Require Creativity or Abstract Thinking” includes copywriters (which I do for technology businesses) and authors. There’s enough writing, creativity and abstract thinking involved in translation, so the profession qualifies for this category. Indeed, capturing every comparative nuance to be found in a given language pair may be more difficult than mapping the human genome. Once that’s done, numerous other language pairs await the same laborious treatment. Count the number of language pairs in the world and the scope of this challenge becomes clearer. Reese’s user manual test offers further comfort. Since writing a user manual for a job is analogous to programming a machine to do that job, try writing a training manual for your job. “The longer the instruction manual, the more situations, special cases, and exceptions exist that need to be explained,” Reese wrote. I’m breathing easier since I read that. Whether your job is at risk is just one of the many A.I.-related questions that Reese explores. narrow A.I. describes technologies like Roombas and adaptive cruise control in modern vehicles Each narrow A.I. technology took years to develop to the point that it does one thing well. artificial general intelligence (A.G.I.) has appeared in all sorts of fiction, from the books of Isaac Asimov and Douglas Adams through to movies like The Terminator and The Matrix. As portrayed, A.G.I. can handle life the way human beings can handle life. And unlike narrow A.I., A.G.I. has yet to appear in real life. Numerous technology vendors breathlessly use the term “A.I.” to attract attention to their offerings. They ignore the fact that all they’ve built are better mousetraps that could not do anything outside of the narrow set of tasks they were designed to tackle. Companies that tout A.I. as a feature risk eye rolls from the increasingly sophisticated audiences they want to reach. You aren’t going to hand the translation of a press release to a Roomba. Terms like “automation” and “labour-saving” might be more accurate. It might be too late for accuracy, though. Reese notes that companies use the acronym for financial reasons. Besides, people group autonomous cars and their Roombas in the same group as Star Trek‘s Commander Data and C-3PO from Star Wars. “It’s a lost cause,” he admits. What must humans understand to create artificial intelligence? Reese is cagey about whether he thinks A.G.I. is actually possible. He explores arguments from both sides. Maybe I should say “all sides” since timelines different people provide for the creation of an A.G.I. range from five to 500 years. Given how thoroughly Reese explores what goes into an A.I., readers might believe Reese’s estimate tends towards the 500 end of this range. He calls himself a “doubter” but not a “disbeliever.” “The book leaves the question open as to whether the computer can think,” he said. Sure, you can program a car to maintain a following distance (adaptive cruise control) and stay in its lane on the highway (lane keeping assist). But how do you program sentience? What about free will and consciousness? Today’s scientists don’t even fully understand these phenomena, let alone how the brain, the model for A.G.I., actually works. Reese reasonably asks how computer programmers can create what science doesn’t yet understand. Then there are elements of the human psyche that Reese barely touches on, if at all. What role do emotions play in intelligence? Could an A.G.I. be programmed with a raison d’être, tempered by safeguards like Isaac Asimov’s Three Laws of Robotics? What about the “bugs” in human systems broadly known as mental health issues? Douglas Adams captured some of these in Marvin, the Paranoid Android from Hitchhiker’s Guide to the Galaxy. Then there’s the brain’s tendency to produce ideas, all vying for attention like bingo balls tumbling in a glass drum. The coup de grâce for A.G.I. optimists may be the notion of evolution. Humans, along with their intellects, have adapted and evolved over time periods ranging from seconds to eons. How do you program evolution and adaptability, particularly in response to circumstances an A.G.I. programmer did not foresee? All these questions represent a staggeringly voluminous amount of coding, plus the need for research into what we don’t know about intellect. Look at the cover again. Even Auguste the robot can’t unravel the A.I. black box. And now that I’ve read the book, Reese has turned me into another Auguste. Reese doesn’t offer easy answers, primarily because there are none to be found (beliefs don’t count). But if you want better questions to frame the challenges to A.G.I., The Fourth Age is the book for you.